Trunks: Ascending to erect; bark grayish brown, fissures irregular, ridges flat or shaggy; wood tan, soft. Twigs: Light reddish brown to grayish brown, brittle proximally, flexible distally, glabrous or pubescent; leaf scars crescent-shaped; buds reddish brown, conic, .08 to .12 inch, apex acute, scales glabrous. Leaves: Deciduous, alternate, simple; stipules on early leaves usually falling early, usually leaf-like on late leaves, ovate to lanceolate, .16 to .18 inch, margins glandular-serrate; petiole with glands distally, .2 to .4 inch; blade lanceolate, 1.6 to 6 inches long, .28 to .8 inch wide, base wedge-shaped, margins minutely toothed, apex acuminate, surfaces green, glabrous, not glaucous. Flowers: Catkins emerging with leaves spreading or lax; staminate: 1.4 to 3.4 inches long, .28 to .52 inch wide, many-flowered, on leafy branches .2 to 1.4 inch; peduncle .2 to .4 inch, villous; bract .04 to .12 inch; pistillate: .9 to 3.2 inches long, .2 to .4 inch wide, many-flowered, on leafy branches .24 to 1.4 inch; peduncle .16 to .4 inch, pubescent; pistillate bract ca. .05 inch, deciduous after flowering. Flowers unisexual, more or less radially symmetric; perianth reduced to abaxial and adaxial nectaries; staminate: stamens 4-6; pistillate: perianth reduced to adaxial nectary; pistil 1; styles 2; stigmas 2. Fruit: May and June; capsules, ovoid, .12 to .2 inch long, .06 to .08 inch wide, 2-valved, glabrous; seeds greenish black, cylindric, tiny, base with tuft of capillary hairs, apex pointed. Habitat: Stream banks, pond and lake edges, flood plains, roadside ditches; prefers moist areas, but sometimes found in drier soil; rich loam, sandy, or rocky soils. Uses: Native Americans chewed the root for hoarseness and steeped the bark to make a liquid taken for fevers and headaches. The liquid was also used as a wash believed to help hair grow. The leaves were crushed and placed on bruises. The twigs were used in basket weaving and the wood used to make furniture, crates, barrels, toys, and doors. During the American Revolution, willows were burned the the charcoal used as an ingredient in gunpowder. Deer and rabbits browse on the twigs and bark. Comments: Dioecious. 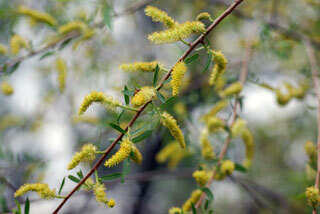 There are several varieties of black willow. It is a fast growing, short-lived tree. Black willow is used to help prevent soil erosion along streams and in ravines.